Royale Lynn is a singer/songwriter from Aylmer, Ontario. From a very young age, Royale was singing, song writing, and performing. She grew up listening to Shania Twain, Johnny Cash, and many more country artists. 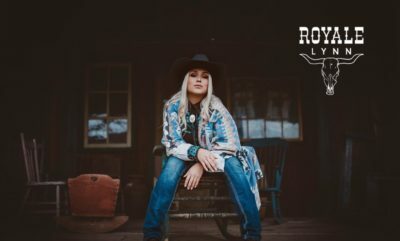 If you ask her mom, Royale Lynn was born wearing cowboy boots. Early on she knew she was going to be a country singer, and enrolled in every singing competition, coffee house, and talent show she could find. At the age of 15 she was chosen from seventy girls to portray “Hannah Montana” in a tribute band. Touring southern Ontario on weekends performing as Hannah Montana, the group even performed at the London Music Hall, the city’s premier showcase music venue. From that moment on life was all about her craft. To master those skills she enrolled in voice, guitar, and piano lessons. She completed her singing grades with the “Royale Conservatory of the Arts”, which she says was one of the hardest things she’s ever done. Eventually she was writing songs for OIART, an audio recording school in London, Ontario. Now 23 years old and making her move to Nashville permanent as of Jan 1st, 2018. She has obtained an internship at a publishing company (which is nearly impossible without going to an American university). Learning a lot about the “behind the scenes” of publishing companies is something she will be able to reflect on while seeking a full-time position as a songwriter at one of those companies. In the mean time, she’ll be performing at The World Famous Tootsies Orchid Lounge on Broadway Street – a local institution where many of the great singer/songwriters have performed. Amongst the work of these exciting opportunities Royale still finds time to write music daily, and she has plans for big things in 2018. Royale Lynn is home for the holidays and playing shows in Ontario. If you have a chance, go and catch one of her local shows before she sets off for Nashville permanently. Download Royale Lynn’s current single “Southern Comfort” on iTunes/ Spotify/ and Apple Music.